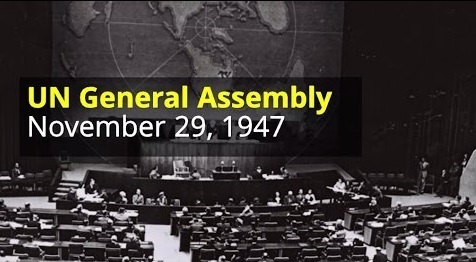 November 29, 1947 is the day on which the United Nations voted to partition the Land of Israel between the Jews and Arabs. This was a very momentous occasion that my mother and others of her generation well remember, even 70 years later. Vintage footage of the vote will probably be all over the news media. However, this was not the first time that the non-Jewish world recognized the need for a Jewish State. During the past summer, I toured a new museum in Jerusalem, the Friends of Zion Museum, about Christian support for the State of Israel. Among the early Christian Zionists they memorialize are Henri Dunant (founder of the International Red Cross and first Nobel Peace Prize recipient) and Queen Victoria. Recently we commemorated Balfour Day, the centenary of the recognition by the British government of the right of the Jews to a National Home in the Land of Israel. However, legally, it is at the San Remo Conference of 1920 that the nations of the world recognized our right to a Jewish National Home. Dr. Gil Troy, an American formerly at McGill University who made Aliyah (immigrated to Israel) deals with whether we need such legitimacy. In a new podcast from Jerusalem U, he discusses challenges to Israel’s legitimacy in academia, from the left, and from extremist Islamism, as well as ties to anti-Semitism. He also provides some of the context for the UN vote and for the Soviet support for the Jewish State in 1947, as well as the support of Harry Truman. He ends with his views about the “betrayal” of the Palestinians. You may find his podcast by clicking here. For information about the many events commemorating the 70th anniversary of Israel’s founding, please visit www.jewishallianceri.org/israel-70. Better yet, join us for a look at one of the unknown episodes that ensured the survival of the State of Israel. On Wednesday, December 6 at 7:00 pm at the Dwares JCC, we will screen a feature-length film by Steven Spielberg’s sister, Nancy. Above and Beyond shows how the chutzpah of American pilots founded the Israeli air force.